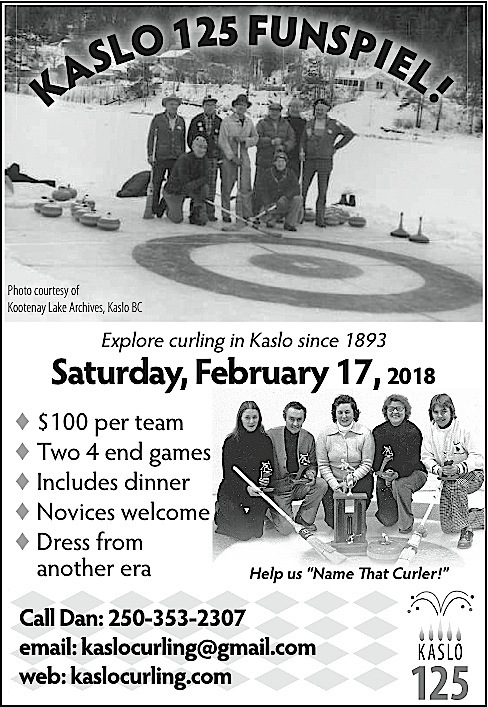 Download the Kaslo 125 Funspiel registration form here (650 KB PDF). Payment can be made the day of the event by cash or cheque. A limited number of extra dinner tickets are available for $15, four tickets are included with registration. Please let us know how many you would like. Details are on the registration form and our Kaslo 125 Funspiel page. A Learn to Curl session will be held Tuesday, Feb 13 from 6:30 to 8 pm, or ask us if you would like to arrange an alternate time for your team.